There is a three week span after the expiration where actual physical delivery takes place, so expect the next two EIA reports to test whatever remaining spare capacity exists at Cushing. 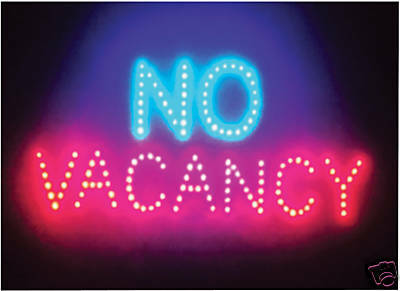 In other words, it doesn`t really matter what is occurring in the MENA (Middle East and North Africa), since over the next month at the next rollover, traders will have to sell any long positions because they cannot take delivery even if they want to. Furthermore, because of the events transpiring in the MENA over the last couple of months, traders who normally don`t take delivery have taken delivery over the last two rollovers, due to ‘what if” scenarios where Saudi Arabia became a legitimate concern, and oil spiked to $130 a barrel. The fallout from this is that traders and investors who normally take delivery will not be able to during this next rollover, as there will literally be no more storage at Cushing. This is very bearish for WTI prices over the next month, as now you are going to have an entirely new segment of sellers come rollover time. As such, expect the U.S. WTI prices to overshoot to the $90 a barrel range as shorts pile in before recovering a little around $93 a barrel at rollover (give or take a couple of bucks in either direction). 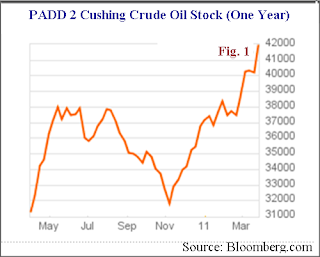 It is just not Cushing, the total U.S. supplies rose for the 10th time in 11 weeks, up another 2.9 million barrels for the March 25 week to 355.7 million (Fig.2). Remember during the summer when oil prices were in the low $70s? Well, inventories were at the height around 368 million barrels, which became a big headwind for long only speculators in crude oil at the time. Demand Destruction by High Oil Prices? So, here we are--only 12 million barrels from that exceedingly bearish level of US storage. And with these high prices we are starting to experience legitimate demand destruction. It seems with these high prices it is only a matter of time before we are again at the 368 million barrels of oil in US storage facilities at the Commercial level. 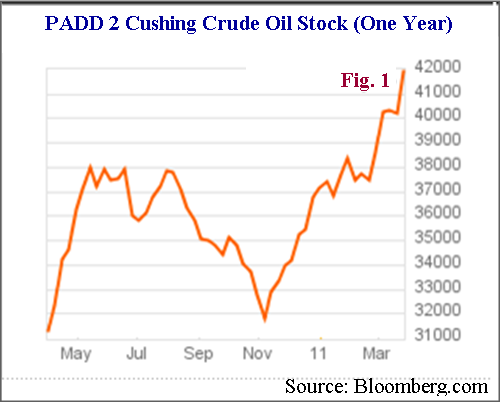 So the Oil Bulls can no longer point to Cushing as an anomaly, we are literally swimming in Crude Oil right now in the US. What’s Up with Rising Imports? The news gets even more bearish for the Brent crowd as the following question should be asked regarding rising imports which are at their highest level in two months, at 9.1 million barrels per day--If there is such a tight supply in crude oil internationally, i.e., reflected in a much higher Brent premium to WTI, then why are imports rising when the US already has sufficient supply right now? The reason is that there is no other place for this oil to go, especially with Japan`s massive cutback due to a natural disaster which has severely hampered much of its manufacturing, supply chain infrastructure, and domestic demand. All of this portends for continued higher import numbers for the next couple of months until Japan starts ramping back up to normal Oil demand statistics. Unfortunately, Brent doesn`t actually have easily discernible inventory numbers, but through logical deduction one can surmise that if supply were really as tight as the price suggests, then imports to the US market would actually be significantly down, and not up. So expect Brent to come in as well over the next month. (Maybe in the range of $105 to $107 a barrel). 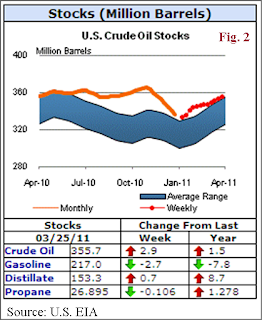 With regard to the product side, gasoline inventories fell 2.7 million barrels to 217.0 million (Fig. 2) for the sixth straight weekly draw as there was a period at the beginning of the year, where we had a succession of inventory builds in gasoline products. The draw reflects decreasing refinery output, at 8.7 million barrels per day for the lowest rate in almost three months. Refineries are cutting output as gasoline demand weakens in direct correlation over the last month due to higher prices at the pump, down 0.1% for the first negative year on year reading since the beginning of February. This is a prime example of economics with regards to higher prices affecting consumer`s driving behavior, enough to lower demand for the product in the market. There is a slight lag between the RBOB futures price and the price paid at the pump, so expect demand to even go down further as gasoline prices fully manifest the appreciation in the futures market. There is some good news for consumers in all of this as oil prices correct down over the next month; prices at the pump will start to go down as well. It is really the only way to get the consumer demand numbers back up and positive year on year, which is necessary to work off these large inventory numbers in crude oil storage. The consumer and the US economy needs lower prices to grow at a significantly higher rate in order to make a dent in an overall saturated oil market. The longer prices stay artificially high, and not reflect true demand in the market, given the current oversupply situation, the correction, when it does occur, will be even sharper (For example the 2008 Oil collapse). The old adage “you can pay now, or pay later” applies to the crude oil market here. You can ignore fundamentals for only so long, in the short term, supplies don`t really matter to traders, but there comes a time when fundamentals in the market supersede political and technical based analysis. In the end, fundamentals have the ultimate and final say regarding price direction in the market. And over the next month, fundamentals will dictate that Crude Oil prices correct to a lower level from current levels. This correction would actually be healthy for the oil market, if this fails to materialize, and oil prices stay high with continuing oversupply, and weak demand, i.e., an artificial mismatch between supply, demand, and price, expect an even “healthier” and fundamentally more severe correction when market equilibrium reasserts itself. Now that I have your attention...., no one can predict where oil prices will actually go as the crude oil market is a complex equation with ever changing variables. However, the purpose of the article is to discuss the developing supply and storage capacity dynamics in the market place. Some other factors which might help facilitate crude oil`s decline would be the stepping down of Libyan leader Muammar Qaddafi, an early ending to QE2, a strengthening US Dollar, and some profit taking in some of the commodity related funds that include Gold, Silver, and Oil. As recent fund inflows have helped prop up WTI beyond purely concerns over the unrest in the MENA region, the exact oil price will depend upon some of these other factors. Nevertheless, it seems reasonable to assume that one factor is quantifiable, and that is the supply issues with regard to storage capacity in the US market. Given these dynamics, WTI should close lower than when it started as the front month contract, and that hasn`t happened in a while, with prices being somewhere in the $90s.